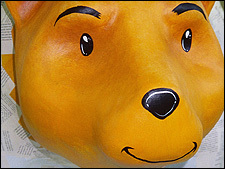 It’s Winnie the Pooh! Colleen Quigney, art instructor at Colebrookdale Elementary School recreated this timeless face, beloved of children everywhere. 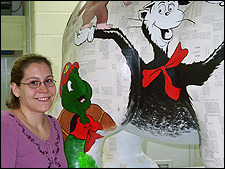 Wearing a matching smile, art instructor Colleen Quigney stands beside her bear and Dr. Seuss’s Cat in the Hat, a feature of the bear she created for Colebrookdale Elementary School. “All right, raise your hands, all of you who love Harry Potter!” Harry gets overwhelming approval from readers of all ages. 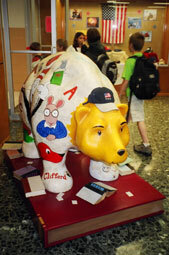 The renaissance in reading he spurred in recent years makes him an obvious choice for Colebrookdale Elementary School’s Bear Fever bear which sports many of children’s favorite characters from books. 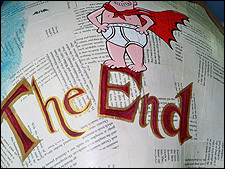 “The End.” Colebrookdale Elementary School’s “Once Upon a Bear” ends appropriately. 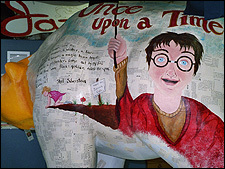 The bear is decorated with characters from books that children love painted over printed words, the tools which gave them life.
. The classroom of art instructor Colleen Quigney is a piece of art itself. 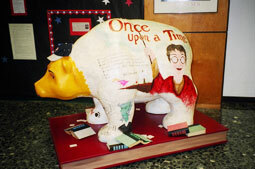 It inspires creativity through the display or designs, sculptures, and assorted tributes to famous artists and artistic styles.
. His platform newly completed, “Once Upon a Bear” welcomes visitors to Colebrookdale's “Hats Off for Travis” ceremony, May 2006.
. Colebrookdale Elementary School decorates for the school’s “Hats off for Travis (Zimmerman)” ceremony to honor his supreme sacrifice in Iraq, April 22, 2006.
. “Once Upon a Bear” shows his support during Colebrookdale’s May 26, 2006, “Hats Off for Travis” ceremony.
. “Once Upon a Bear” debuts at BASH's 2006 Arts Expo. Spoke to the HSA president(Mrs. Diane Kulp) and vice president(Mrs. Tina Kurtz) they provided me with some information on what the HSA does for the school and why they sponsored the bear. 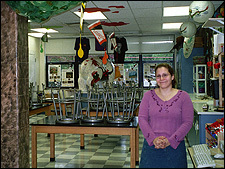 - The HSA helps to support the students. If the district won't purchase something, the HSA will evaluate the situation and provide funding if approved. A Bear Fever Representative from Boyertown Elementary spoke to the Colebrookdale HSA about the project. The organization thought this would bring a sense of unity to Boyertown along with involving the students. Miss Quigney, the art teacher, will be the only artist actually painting on the bea r; however, the students are taking part by making suggestions for an over all design. 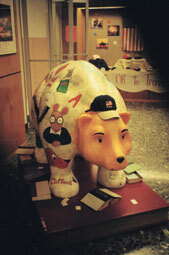 When the bear is complete , it will be displayed inside the lobby of Colebrookdale Elementary. I spoke to a few teachers to acquire their opinion on the project as well. 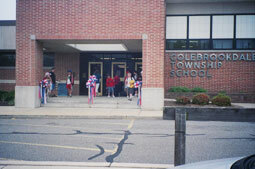 -After speaking to several teachers, aides, and other staff members at Colebrookdale the overall opinion about Bear Fever is positive. Many teachers seemed to have knowledge of the Bear Fever idea previous to my explanation. I was informed of birds in Delaware, and cows in D.C. that were designed and now decorate the city. "Excellent idea!" "Brings the students together." These were comments I received when I asked them their opinion about this project. Many staff members would like to see the students more involved or continue their already existing "fish" theme on the bear as displayed in their school hallways and classrooms. Other design ideas were self portraits of the students and a contest to pick a name for the bear. Another interesting design would be including all of the items brought back by the teachers who visited the Ukraine, our sister city. The staff seems to feel that this will bring uniqueness and start conversation, it’s a creative endeavor that pulls generations together. They feel it incorporates community spirit and are excited to see the finished bear. - The parents of CES were more skeptical at first. They saw other, more important uses for our district's funding. They have come to see the project as something that will bring the students closer and cause them to become more involved in the other schools and community. They would like to see the students actually doing the painting and designing rather than just brining up creative ideas. Parents still feel that no matter how close this brings a school it won't top cruel events from occurring in our community and schools. - The students seem to be very excited and motivated about the project. They have suggested many designs for the bear, a few being characters from their favorite stories or just random thoughts that come to their minds. They told me "the coolest thing about Bear Fever is that it represents them and their school." (very sophisticated 3rd grader) They feel proud and important, as if their school stands out. - is described as quiet, willing to help anyone, can never say "no"